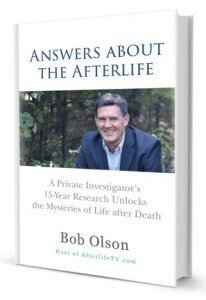 Bob Olson: “In this interview—where Richard Dugan from Tell Me Your Story interviews me, Bob Olson—I reveal the deeper insights from my 15-year investigation of life after death, including what I’ve learned about God, heaven, hell, religion, what it is that leaves the body when it dies, what spirits do in the spirit world, what evidence exists for the survival of consciousness, the difference between believing and knowing, how we can know about the afterlife if we haven’t experienced it, and so much more. 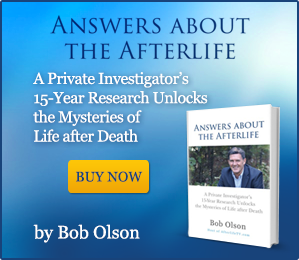 Bob Olson talks about the wisdom that can be learned by investigating the afterlife. This interview was originally aired on “Tell Me Your Story” with Richard Dugan: http://www.richarddugan.com/tmysradioshow.htm — check out other interviews by Richard. The video on afterlife after suicide was excellent! Question: I believe there is life on other places other than on earth. Do our souls go to other worlds in different life times? Thank you! Yes, my investigation leads me to believe that our souls experience life in other worlds (dimensions) as other living beings. Great conversation, Bob. I have read your book, loved it, and felt it aligned with much of my own journey searching for answers after the death of a loved one. Today, I truly appreciated listening to your thoughtful and heartfelt responses to the questions asked by Richard Dugan. Your conversation helped me. Thank you. You’re very kind, thank you. I’m glad you liked the book and interview. I appreciate you taking the time to write and tell me. Sorry about your loved one’s passing. Best wishes to you over the holidays. I know that’s a difficult time of year. Do you have a video where you talk about your experience of your life after death of one of your prior life regressions? Excellent interview with Richard Dugan, he asked the right questions! You gave him what he wanted to know. 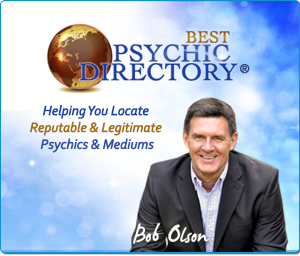 I am so thankful that I came across your website 2 years ago after the lost of my loved one. Now I am at peace knowing that he is at peace. I cannot thank you enough for all the work you do. I cannot wait for new discoveries. That’s wonderful and what learning about life after death is all about…being at peace. I’m glad you found us two years ago, and I thank you for writing. Hi, Bob; been awhile! OUTSTANDING INTERVIEW! Keep up your excellent work as it educates, alleviates and is much appreciated – thank you! Nice to hear from you again. I appreciate your comment and hope you are well. Happy Thanksgiving! And a happy thanksgiving to you, too; my friend!! And hi to Bobby too, because I know he’s aware of our correspondence. Thanks for writing. I’m glad you liked this interview. It was funny because I felt kind of silly giving that answer at the end, but it’s the truth — she really is the person I strive to emulate. Glad you liked her photos too. I think they go well with these audio-only interviews. Happy Thanksgiving to you both. Again, another excellent interview! From the looks of it, I don’t think we’ll ever really have “The Answer” to the what’s, why’s and how’s after our bodies die – and for me, that’s what makes all the research into it so much fun. It’s endless! They always get us with the paperwork, lol. Thank you. I always love your interviews. I got involved with paranormal research recently, and find it fascinating. I’ve had some interesting things happen in my life I can’t explain, so it’s nice to listen to other peoples stories, and experiences. Keep on doing great work! When you talked about our true ‘essence’ and God I am right with you even though I have only been into this stuff for over a year now. I have sought out various experiences with spirit guides and meditate and I am very comfortable with your and Newton’s books. 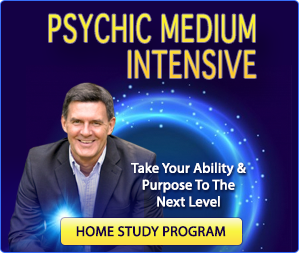 I am a little frustrated that I have met a number of people that have had ‘spirit”, past life, NDE, etc. experiences but are content to let it come to them versus seek more. I need patience I guess! What I’ve learned is that life’s frustrations and dissapointments regarding other people only occur because we have expectations of them. And what is right or good for you is not necessary right or good for another. If you try focusing more on what you do and say, and how you treat others, and let go of expectations of other people, you will reach a new level of experience that holds wisdom in itself. In this way, patience isn’t needed since we no longer concern ourselves with what others are doing to better themselves. And much like forgiveness, which lifts a burden off the forgiver even more than those he/she forgives, removing expectations of others lifts a huge burden off you that will feel like you just lost twenty pounds of emotional weight. Hi, Bob. 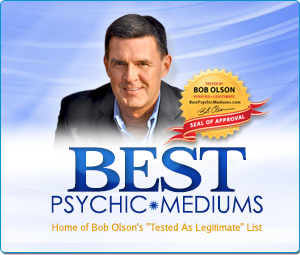 Love your informative insight into the spiritual realm. 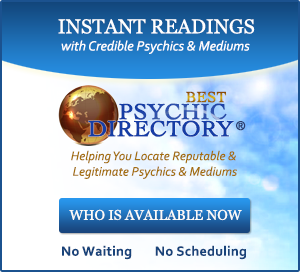 I’ve only recently discovered your website while searching for information about life after death. I do have one question and wonder if you can help me on this? It is the subject relating to our souls. If, say, about 6,000 years ago, the world’s population only consisted of several hundred thousand people (souls) – and today’s population is over 6 million people, where did these extra souls come from? Many people have this question, and it’s a good one. And of course nobody knows for sure. What I’ll say to begin is that we humans can’t talk about spirituality, particularly souls, and expect the numbers to add up. That said, we cannot count the number of people on the planet and determine that this is the number of souls in the spirit world – or even think it’s close. Evidence exists that we as souls experience lives in many places, and many life forms, in places (dimensions) of which we are not even aware. Add to that the possibility, even likelihood, that souls can experience more than one life at a time, and now the numbers mean absolutely nothing. I could go deeper, but I’ll keep it simple because I think that answers your question. Great interview. This was a very a informative and helpful interview as they all are. Thank you for what you do, you truly are a gift to us ! You are most welcome. I’m pleased it spoke to you. My son was murderered by an evill being on January 10th, 2016. Someone he would have crossed paths with in life. I’m struggling in the darkest, most painful nightmare of my life. Haunted by his last moments of life felt like to him, if he was in pain & if Heaven feels safe to him right now. I am going to purchase your books today. From the little I have read of your teachings, I’m anxious & so much need to understand the my questions. I feel dead. I miss my son. There are a lot of episodes that you might want to watch, so check out out Afterlife TV to see all that we offer. I absolutely enjoyed this interview with Richard Dugan. Thank you so much Bob and Richard! Thank you Bob, for your outstanding interviews. You are beautiful human being. This world needs more people like you. Best wishes.